Incisive yet supple, wrenching yet deeply pleasurable, The Three Burials of Melquiades Estrada easily ranks among the year's best pictures. Tommy Lee Jones' bracing bigscreen directorial debut, which copped acting and writing awards from the Cannes Film Festival jury, connects with both the head and the heart. Tommy Lee Jones makes a sure-handed feature directing debut and gives one of the best performances of his career. A man is shot and quickly buried in the high desert of west Texas. The body is found and reburied in Van Horn's town cemetery. Pete Perkins, a local ranch foreman (TOMMY LEE JONES) kidnaps a Border Patrolman and forces him to disinter the body. 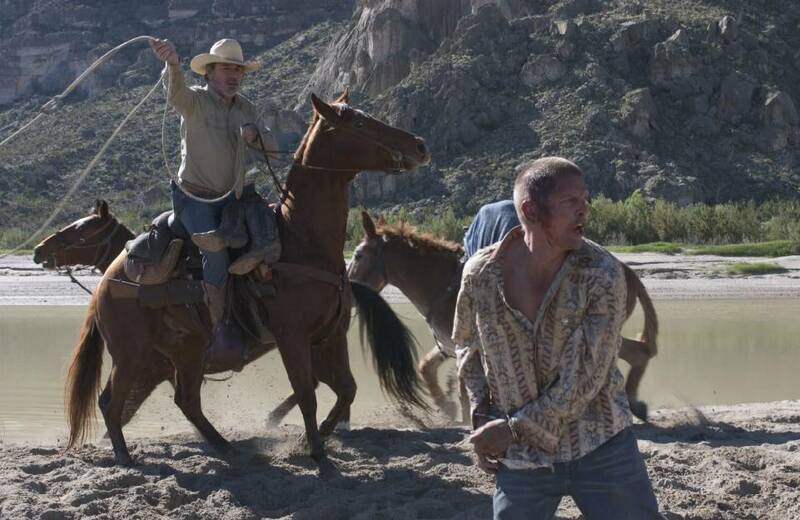 With his captive in tow and the body tied to a mule Pete undertakes a dangerous and quixotic journey into Mexico. Guillermo Arriaga's dramatic and poetic script weaves past and present as it gradually reveals a great friendship, the lonely subterfuge of an illegal migrant's life, the cost of a promise made and kept, and culminates in the redemption of a callous if accidental killer.